Cavestomp! 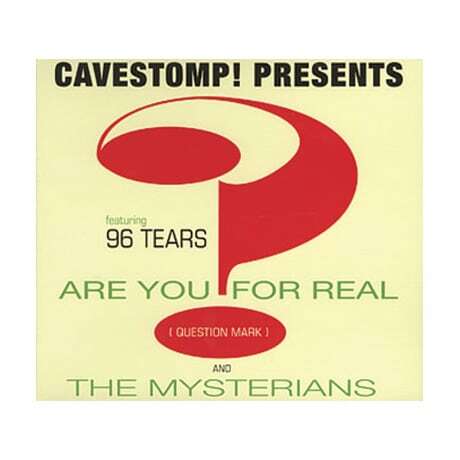 Presents Question Mark and the Mysterians: Are You for Real? Although they only released two albums during their 1960s heyday, Michigan's Question Mark and the Mysterians were a significant influence upon garage rock and an inspiration for punk rock. Following the band's 1997 reunion, they went into the studio to re-record some of their old favorites; their million-seller, number one hit "96 Tears" appears here—as does a Spanish-language rendition—while the other 16 selections include "Ain't It a Shame," "I'll Be Back," "That's How Strong My Love Is," "Beachcomber," and "Don't Give It Up Now." A 1966 demo of "Are You for Real?" is also featured, along with a 1998 concert recording of "I Need Somebody."